Mario is celebrating the opening of the Mini-Land amusement park with Pauline by giving away Mini-Pauline toys to the first 100 customers. The 101st customer is Donkey Kong, who becomes enraged. He grabs Pauline and runs into the park. Mario and the Mini-Mario toys give chase. You have to place girders, springs and ladders in the path of Mini-Mario toys, then activate the toys so they make their way to the exit door. Once activated, a toy can't be stopped, so you have to plan your path carefully. 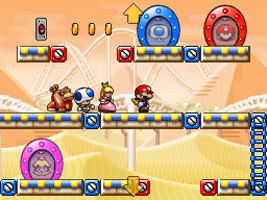 The game features a level editor, and your custom levels can be shared through a local wireless connection or the Nintendo Wi-Fi Connection.